Now a professional look for your games. "The buzzers are WAY Cool!" "I had the buzzers at the end of a 185 foot cat 5 (using a USB extension over Cat 5 kit)." Many of our customers desire a better solution to 'buzzing-in' when playing our games. We've always worked to allow our software to be within the grasp of the typical user (we've never appealed to the user with unlimited financial resources). We believe with support for this new buzz-in hardware, users can easily and inexpensively upgrade to a professional looking system (without spending hundreds of dollars). All of our software has been designed for the user to be able to use the keyboard and mouse, the standard configuration of a computer. When we first saw the Playstation 2 game Buzz!, we were impressed by the buzzers that came with the game (at a very reasonable cost!). Then our programming team modified our software to work with Buzz! Buzzers for our major software packages that use buzz-in devices. You will need 2 pieces of hardware. A computer that capable of running Windows 98 or later. 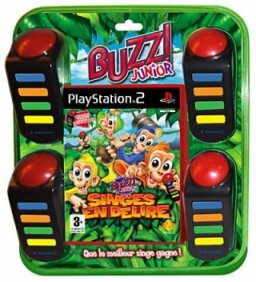 The WIRED* buzzers that comes with the PlayStation 2 game (Buzz!, Buzz! Junior, and a variety of other titles). To avoid confusion later on, label the controllers as "1", "2", "3" and "4". These PS2 games (buzzers included) can be purchased for around $25 from Best Buy, Amazon, eBay and a host of other places. *Do not buy the package that comes with wireless buzzers. Also, when you purchase the software, make sure that it comes with buzzers. Some distributors sell the game only (some users already have the buzzers and don't need another set of buzzers). The latest versions of our most popular programs have been updated to run with Buzz! Buzzers. Some are scheduled to be updated, and others will not be updated. * The table below summarizes what programs have the built-in support for Buzz! Buzzers. The reason some of the programs are not scheduled is that they don't require or need the 'buzz-in' capabilities. As an example, The Strongest Link operates almost exclusively using a mouse, buzzers are never used. *The length of the cable is about 7 feet from the USB junction (labelled A. in the picture about) to the computer. The length of the cable from the junction to each buzzer (labelled C. in the picture about) is about 6 feet. The cable labelled as B. plugs into the USB of your computer. *That's right, order one program, get the second one FREE ! ! ! When placing your order, add '241' in the Comments section and tell us what you want for the second program.